What could Bruce & Bogie share in common? In this third edition of the connection game, you will once again be given be a pair of films, TV series, performers, or any combination thereof. Your task is to find the common connection between the pair. It could be anything--two stars who acted in the same movie, two movies that share a common theme, a film that inspired a TV series, etc. As always, don't answer all the questions so others can play, too. There is a single best answer for each question. 1. Come and Get It and King Kong (1976). 2. Otto Preminger and Arnold Schwarzenegger. 3. The films Operation: Kid Brother and Diamonds Are Forever. 4. The film The Green Slime and the TV series Wagon Train. 5. Peter Lorre and Doris Day. 6. 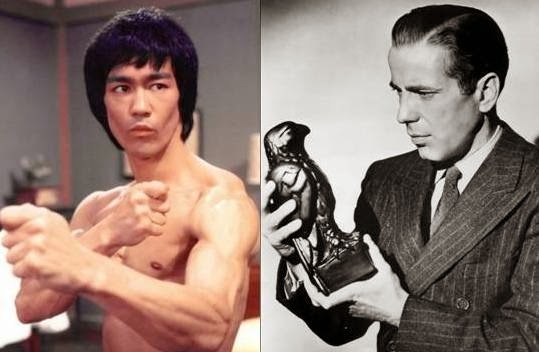 Bruce Lee and Humphrey Bogart. 7. The TV series The Fugitive and Dr. Kildare. 8. The TV series Mission: Impossible and the movie Muscle Beach Party. 9. The TV series The Green Hornet and The Dukes of Hazzard. 10. The TV series The Patty Duke Show and the film A Stolen Life (1946). 11. The film Mad Love (1935) and the TV series The Addams Family. 12. The TV series Have Gun--Will Travel and the film The Thomas Crown Affair (1968). 13. Elizabeth Montgomery and Katherine Ross. 14. The film The Graduate and the TV series Get Smart. 15. Vincent Price and Claude Rains. #2 Otto and Arnold both are Austrians. #11 Peter Lorre's character's appearance in Mad Love inspired the look for Uncle Fester? CW, you were off to a quick start this morning and are correct on 13, 14, and 15! Jenni, #10 is correct, but there are better answers for 2, 7, and 11! 1) Frances Farmer is in Come and Get It and Jessica Lange is in King Kong. Jessica played Frances in the movie Frances. Right on both questions! Impressed with your prompt answer to #1. And you are 2 for 2! 2)Otto Preminger and Arnold Schwarzenegger both played Mr. Freeze. Otto in the TV Show Batman and Arnold in the movie Batman & Robin. Very good! And we could have added Eli Wallach to the group, too. #9. Both involve iconic cars. "Black Beauty" for the Green Hornet and "General Lee" for the Dukes of Hazzard. 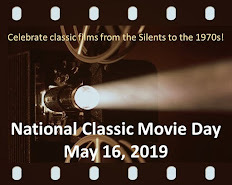 The more obscure answer, and we never know which you want Classic Film and TV Café, is that "Green Hornet" featured martial arts star Bruce Lee and "Dukes of Hazzard: Reunion" featured martial arts star Cynthia Rothrock. The iconic cars is the intended answer, but the Cynthia Rothrock connection is awesome! Well done, Toto! I always thought it was funny that Peter Lupus was billed as Rock Stevens in the MBP credits. The only questions still unanswered are 3, 6, and 12. #6. Humphrey Bogart played Philip Marlowe in "The Big Sleep", based on the Raymond Chandler novel. Bruce Lee co-starred in "Marlowe" (who was played by the late great James Garner, based on another Raymond Chandler novel, "The Little Sister". Or were you looking for a Cynthia Rothrock connection??? Marlowe was indeed the connection! #12. Paladin's business card in "Have Gun Will Travel" featured a knight chess piece. Steve McQueen and Faye Dunaway played a rather memorable game of chess in "The Thomas Crown Affair". Okay, I see what you did with number three! Operation: Kid Brother and Diamonds Are Forever both star real-life brothers. Neil Connery is in the former, and Sean Connery is in the latter. Impressive, Beth Ann! Not many people are familiar with Neil's movie (which is probably good news for them). An Interview with Jon Provost from "Lassie"